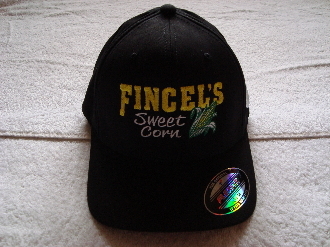 Fincel's Sweet Corn FlexFit Hat. 60% Poly/ 38% Cotton/ 2% Spandex. Quick drying, breathable double faced fabric, low profile, hard buckram front, stitched eyelets 3.25" crown. Featuring Fincel's Sweet Corn Namesake. Show your support of Dubuque's own Fincel's Sweet Corn today! Select S/M 6.75" - 7.25" L/XL 7.125" - 7.625"